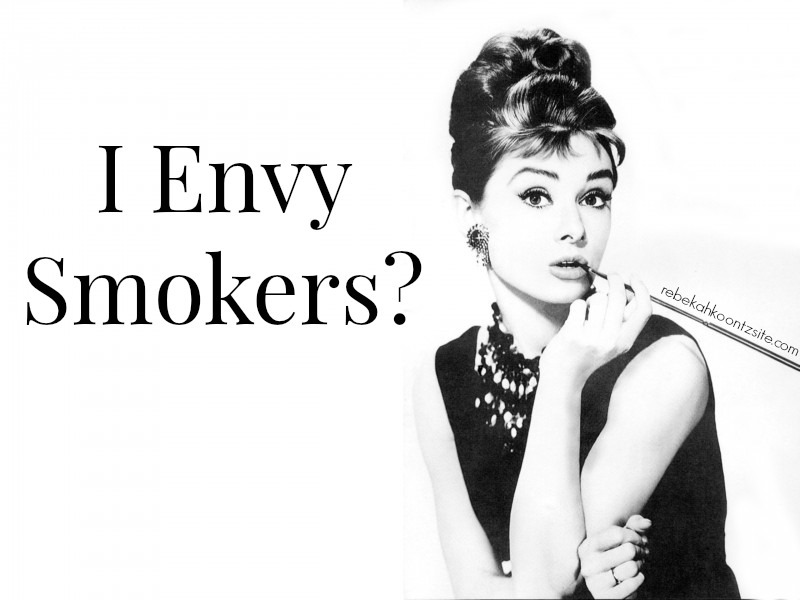 March 27, 2015 March 27, 2015 Categories Life, ThoughtsI envy smokers, Jealous of smokers, Jealousy, LIfestyle Blogger, Nonsmokers, Nonsmoking, Smokers, Smoking, Thoughts13 Comments on I Envy Smokers? I don’t smoke, but I envy smokers. Smokers have different rights compared to us nonsmokers. Smokers get breaks dedicated to their smoking. I want a break dedicated to my bad habits. I want to stand outside and enjoy the fresh air, and watch the birds, and sit in the sunshine, but I feel that, unless I smoke, this time spent daydreaming outdoors is something I should do “on my own time”. Yet smokers get away with it. I have a problem with smoking. Smoking is glamorized and socially justified self-harm. If you do smoke, I don’t judge you. You have your personal reasons for doing it, so that’s your business. But it’s bad for you no matter your reasons. So I’m jealous of smokers, and I’ll admit to it. I’m not jealous because I’m not polluting my body and cutting my life span in half. I’m jealous because of the time smokers get all to themselves. I don’t understand how this happened, but I want in on it. Does society give more leeway to smokers because we understand it’s an addiction? Do you have to be addicted to something to get special treatment? Could I possibly go up to my boss and say, “I need to take a five minute fresh-air break,” and go sit outside? Or will I have to give more of an excuse or urgency to take up the time my boss is paying me to be there to sit outside while work needs to be done? I wanted to present these thoughts to you, to the world, to see what you have to say about it, smokers and nonsmokers alike. Because I’m seriously missing out on something. Your comment made me laugh out loud. Great points! I’ve heard this argument before. All I have to say is, do you really think that they get away with it? Management knows who smokes. And they should know who’s productive and dependable. If the smoker can perform even with their ‘extra’ breaks, then maybe they earned it. But if they can’t, then management should know, and you should be shown appreciation. If you are not, and management is blind/incompetent, then take this as a sign to look for work where you will be appreciated. Pondering this and getting bitter is as unhealthy as smoking. These used to be my pet peeve at work, but luckily for me only the managers that smoked would let employees take a break, so they wouldn’t always get away with it. I just used to take extra loo breaks and make a point about the smokers if anyone complained. At the end of the day, you just gotta be safe in the knowledge that you’re the better employee – and make the most of the nice weather when you finish the shift! I have nothing to say but.. Amen! That’s so true! I didn’t even mention restaurants! Eating and smoking is so gross. I would think it messes up the taste of the food. If anyone asks, just tell them you’re having a smoking break but you’re exercising your freedom of choice and opting out of the smoking part. Smokers get a break because it’s a sign of stress. That’s noted as the most common reason why people smoke as it does relieve stress to a certain extent. I am speaking from experience here. Corporate companies allow a smoking break because they do not want their emplayees to self destruct due to work related stress as that would reflect badly on yhethe company. At the same time, they do not wish to cut down the work load. As to why young people smoke: we have a bunch of real life decisions to make which will alter the course of our lives and a very short time to make those decisions. That’s pretty scary in my opinion. We do need time to forget it all and make some friends over a smoke and laugh about stupid stuff that (according to adults) don’t really matter. I felt the same way so I’d often go outside with the smokers. In order to justify it I ended up smoking. Now I need to go out with them because I need to smoke. After some laughing from the smokers, it’s accepted that I’m in the same boat as they are.